Line up and get ready to sample your first taste of the newest edition of Canada’s best-selling line of pickup trucks, almost 50 years running and counting. Ford’s light-duty truck routinely takes its place as one of the most hotly anticipated new vehicles of the year. This year’s model has Ford’s new Sync 3 infotainment system and twin-turbocharged V6 engines, powering up the model over previous years’. The 2018 F-150 also offers a new Pro Trailer Backup Assist option so you’ll be able to develop your already amazing parallel parking skills. The 2015 model of the Ford F-150 introduced some revolutionary redesigns that are well worth the annual hype and this year we’ll see the full realization of the new F-150’s potential here at Metro Ford in Port Coquitlam, BC. Like a superhero rebooted for a modern revival, the Ford F-150 shed its old shell last year and replaced it with a stylish new body of space-aged materials. In this case, Ford engineers have replaced much of the steel that formerly made up the body of this pickup truck with NASA-quality aluminum. But don’t worry, this lightweight steel–which so far is estimated to have dropped 700 pounds from the frame of this truck–is sturdier than steel and performs better under stress and collisions. It also protects better against dings, dents, and scratches. Add to this mixture a new 2.7L EcoBoost engine or a twin-turbocharged V6 engine, and we are destined to see a truck that maintains its performance and makes tremendous leaps in efficiency. The new 2018 Ford F-150 has arrived at our Port Coquitlam dealership, so come in and test drive one today! Metro Ford is your top customer service destination for new and used Ford trucks in the areas of Maple Ridge, Port Moody, Pitt Meadows, Burnaby, and Surrey, BC. An engine is as strong as what it needs to propel, and with a 700-lb drop in weight for the recent editions of the Ford F-150, towing and fuel economy are much better. The F-150 comes with one of several engine choices. 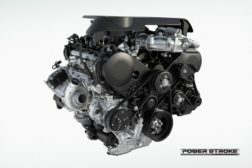 The 2.7L EcoBoost V6 engine will put out 325 horsepower and 400 lb. ft of torque (11.9L / 100km City, 9.0 Highway, and 10.6 Combined). You can also choose from the 3.3L Ti-VCT V6, pushing 290 HP at 265 lb.-ft. (10.9L / 100km Combined); the 3.5L Ecoboost at 375 HP and 470 lb.-ft. (12.0L / 100km Combined); or the 5.0L Ti-VCT V8 at 385 HP and 397 lb.-ft. (14.6L / 100km Combined). Both 4×2 and 4×4 configurations are available too for each model. 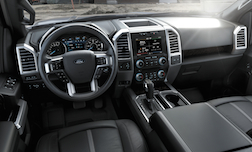 Trucks have always been associated with hard work and ruggedness, but that doesn’t mean that you need to lead a Spartan existence inside the new 2018 Ford F-150. Ford has assured that with this latest edition of their best-selling truck, you have plenty of options for box length, cab size, and trims, meaning that like selecting the right pair of blue jeans, you’ll be able to find the one that perfectly matches your demands for work and comfort. But one new feature that Ford has already leaked to the automotive media is the 115V outlet; now when your batteries need charging, it doesn’t have to mean the job is put on hold. Ford’s Sync 3 infotainment system replaces the MyFord Touch system, and we’re excited about the switch. For 2018, the Ford F-150 now is available with diesel power! The all-new 3.0L Power Stroke Turbo Diesel V6 is based on the outstanding legacy of the Super Duty line of diesel engines. This means plenty of power (440lb-ft of torque at just 1750rpm) and a ton of carrying capacity (11,400lbs towing and 2,020lbs payload). You can expect this all-new powertrain to be available this spring! It’s the parts that make the truck. Get the best ones today and explore Metro Ford’s rim and tire selection, or visit our Port Coquitlam Parts Department to shop for and learn more about everything from aftermarket performance parts to replacement parts and body kits. With warranty-approved OEM Ford Parts, your Ford F-150 will last through the decades. And when you’re ready to treat your truck, order Ford truck parts online and we’ll have them in store and ready for you in no time.